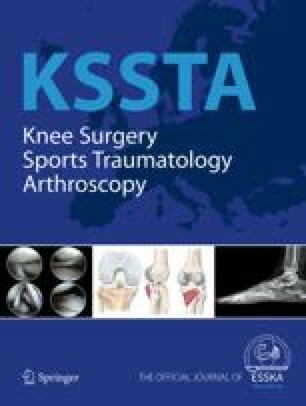 This retrospective review evaluated the results of arthroscopy-assisted surgery for tibial plateau fractures in 45 patients with closed tibial plateau fractures. The fracture involved articular depression in 27 patients in whom lifting and bone grafting with autogenous corticocancellous iliac bone graft was required. In 23 patients there were also meniscal lesions, which were treated by partial resection in 16 and repaired in 7. Internal fixation was performed using screws in 36 knees and plate in 10 knees. Radiological results were evaluated according to the Resnic-Niwoyama criteria; mean follow-up was 36 months (range 14–72). There was no intraoperative complication in the series, but postoperatively there were one infection and one loss of correction. Results were satisfactory in 89% of cases, according the Rasmussen criteria. Arthroscopy is thus an excellent and minimally invasive method for assessment and treatment of tibial plateau fractures. The advantages are complete and anatomical reduction in the fractured articular surface and evaluation of other concomitant intra-articular pathology and entails only little additional morbidity, especially compared to arthrotomy.